Selected for Cannes Directors’ Fortnight, this gorgeous animation by Mamoru Hosoda is a time-travelling adventure about a young boy and a magical portal. Four year-old Kun is disappointed when the new baby in his family promptly replaces him as the centre of attention; he refuses to accept his little sister, Mirai. When a magical and mysterious gateway opens in the garden, Kun has the chance to encounter his family members when they were young themselves. He is also visited by an older girl with the same name as his sister, leading to a series of surprising adventures, which change how he sees the world. 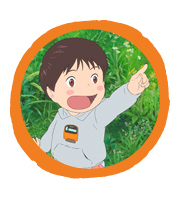 Hosoda (The Girl Who Leapt Through Time, Wolf Children) has had remarkable box office success in Japan and abroad, and is often proclaimed as the successor to Studio Ghibli’s Hayao Miyazaki. In Mirai, Hosoda has made another visually glorious and entertaining film.